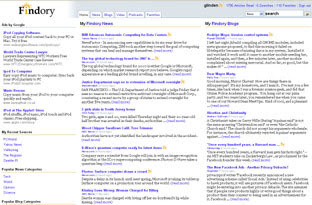 Findory was a personalized news site. The site launched in January 2004 and shut down November 2007. A reader first coming to Findory would see a normal front page of news, the popular and important news stories of the day. When someone read articles on the site, Findory learned what stories interested that reader and changed the news that was featured to match that reader's interests. In this way, Findory built each reader a personalized front page of news. Below is a screenshot of an example personalized Findory home page. Articles marked with a sunburst icon are personalized, picked specifically for this reader based on this person's reading history. Findory's personalization used a type of hybrid collaborative filtering algorithm that recommended articles based on a combination of similarity of content and articles that tended to interested other Findory users with similar tastes. One way to think of this is that, when a person found and read an interesting article on Findory, that article would be shared with any other Findory readers who likely would be interested. Likewise, that person would benefit from interesting articles other Findory readers found. All this sharing of articles was done implicitly and anonymously without any effort from readers by Findory's recommendation engine. Findory's news recommendations were unusual in that they were primarily based on user behavior (what articles other readers had found), worked from very little data (starting after a single click on Findory), worked in real-time (changed immediately when someone read an article), required no set-up or configuration (worked just by watching articles read), and did not readers to identify themselves (no login necessary). Findory's primary product was in news, but the broader goal of Findory was to personalize information. Toward that, Findory had alpha features that would recommend videos, podcasts, feeds, advertisements, and web search results. Video, podcast, and feed recommendations worked much like the news recommendations. The advertisement recommendations were an unusual form of fine-grained personalized advertising that attempted to target advertisements based not only on the content of the page, but also a person's reading history on Findory. The web search was an unusual form of fine-grained personalized web search that modified Google search results to feature items clicked on by searchers with similar search behavior (recommendations) or that were clicked on by this specific searcher in the past (re-finding). At its height, Findory was a popular website with over 100k unique visitors and 5M page views per month. Findory was well reviewed and received press coverage in the Wall Street Journal, Forbes, Time Magazine, PC World, The Times, Spiegel, Seattle PI, Seattle Times, Puget Sound Business Journal, KPLU, Slate, and elsewhere. More information and more details on Findory's history can be found in my many previous posts on Findory. Greg, how do you filter out multiple articles that are basically the same article that are generated from article submission software such as Artemis Pro? Just curious and thanks. Why did your site was stopped ? To this day I miss findory. I never found an alternative. In general, to filter out near dups, you need to define a similarity metric and then eliminate articles under some threshold of similarity. A common technique used for web search is to hash a bunch of signatures for sections of the page (usually after preprocessing to strip off the navigation elements of the page, advertising, etc.) and then consider the pages near duplicates if enough of the signatures match. Greg, I think get getprismatic.com is finally the replacement for findory.com I was looking for. Amazing that it took 5 years for something to come along. Thanks for the kind words about Findory and pointing to Prismatic. It is a pretty fun app, though more of a feed reader than personalized news in my opinion. If you'd like more details, I put a brief review of Prismatic up over on Google+.